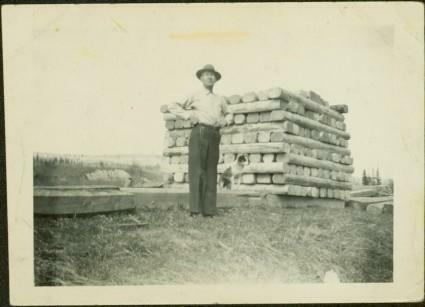 Glassey stands with dog by tall pile of logs built for unknown purpose, hills and cliffs in background. Handwritten annotation on recto of photograph: "Hullat, B.C." Item is part of the Taylor-Baxter Family Photograph Collection. See also item 2009.5.2.311 for image referring to "Hullat." Stamped annotation on recto of photograph: "63".